For a complete explanation, please see "Literary Weavings: Extending Response through the Arts"
The Literary Weaving makes an excellent group or whole-class extension project that works well for students of all ages – and all levels of artistic experience and ability. Using a strip of adding machine tape, each student designs a visual using symbols, colors, and words to capture significant ideas or themes from the book. • Students revisit the book and review their Golden Lines, journals, or discussions to pull out “big ideas.” It may help to discuss with others. • On the back, students write the book’s title and a Golden Line. The strips can then be woven together, either as a temporary artistic installation on the floor or more permanently as attached to a colored border. • For an effective presentation, gather all students in a circle with floor space in the center. One at a time, each student reads her/his Golden Line and says the title of the book. Then lay the strip on the floor. 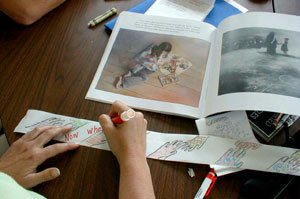 As others add their strips, the teacher (or students) can begin to weave them together. 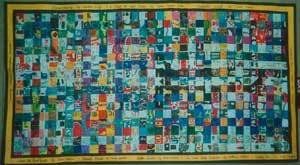 • When the weaving is complete, ask students to talk about what they see and how they interpret their art. The photo on the left below shows how a whole-class weaving looks from a distance -- fusing all images into a colorful and serendipitous pattern. This weaving was designed from a whole-class reading of Roll of Thunder, Hear My Cry by Mildred Taylor. 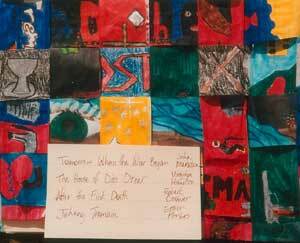 The example on the right shows close-up detail of a whole-class literary weaving based on four literature circle books: Tomorrow When the War Began by John Marsden, The House of Dies Drear by Virginia Hamilton, After the First Death by Robert Cormier, and Johnny Tremain by Esther Forbes. In this case, each student designed an individual strip based on the book he or she read. 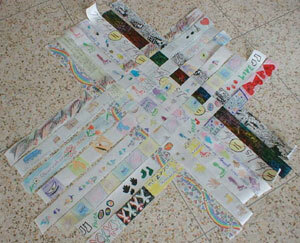 Then all strips from the class were woven together.